Only at ProSource® of Denver will you find the best wholesale home remodel products at the most unbelievable prices. Whether you’re a trade professional or an independent contractor, ProSource of Denver has what you are looking for when it comes to those individual or large-scale bathroom remodel projects. The bathroom sink is a fundamental piece of any project. Whether your client wants to keep things traditional with a sink as part of the vanity or wants a standalone pedestal sink, our collection won’t disappoint. 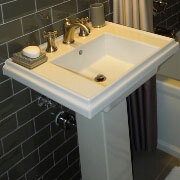 It includes pedestal, shroud, standard, vessel, and wading pool styles of sinks. And that’s just the beginning. The faucet is the perfect complement to the sink. It makes it both usable and decorated. 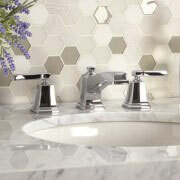 Faucets at ProSource come in a variety of colors and materials, such as brass, bronze, chrome, stainless steel and more. Our experts make sure your client gets a faucet with the correct measurements and type to match their sink. The shower is a place where many people go to retreat from a stressful day or a place to get ready for a busy morning. It’s also one of the most fun projects to remodel because it tends to look substantially different after the project is complete. The ProSource collection includes everything professionals need to update or completely remodel a shower, including the faucets and handles, doors, and other accessories. 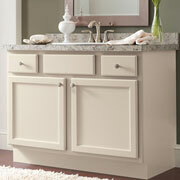 The vanity is another place for your client to reflect their personality, as vanities come in all sorts of styles. From large double-sink vanities to small countertop units, a vanity tends to function as storage as much as another piece of design. Replacing the bathtub in a bathroom can be just what the space needs for a fresh new look. Get rid of that outdated, chipped tub, and replace it with a new tub. 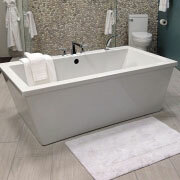 Browse our collection to find all types of tubs: freestanding, clawfoot, standard, corner, jacuzzi, and shower-tub combos, of course. Additionally, we can help you pick out the right hardware for the tub, from retractable hand-held handles to fixed faucets on the tub frame and more. The commode is more than just a place to do business. It’s the throne of the bathroom. Though often under-appreciated, the toilet deserves some thought during a remodel. Does your client want a toilet with eco-friendly flush ratings, or a more comfortable seat? The possibilities are endless. 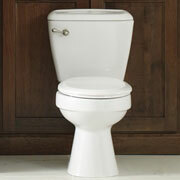 ProSource will make sure you get the right-sized toilet for your space.